CallTrackingMetrics’ advertising reports equip marketers with the knowledge to make smarter, strategic decisions when optimizing their advertising campaigns. Reduce wasted marketing dollars on campaigns that aren’t performing and invest in campaigns that are generating not just calls, but high quality calls that result in conversions. The advertising reports provide you with all the information you need, from the granular details about each call to the high level reporting about your campaigns. They expose performance trends and provide you with analytics around which advertising channels are bringing in the most phone calls, making the most sales, and bringing the most qualified leads. 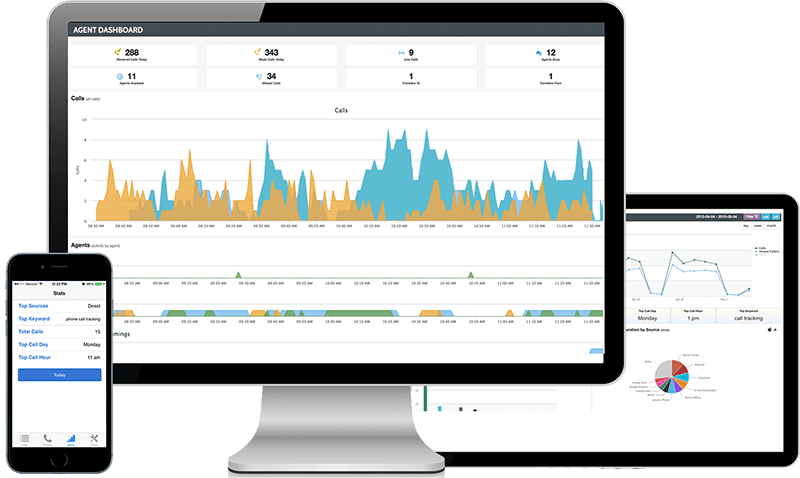 Provide in-depth analytics about your online advertising campaigns such as Google Adwords, Bing, Display, and SEO and expose performance trends on every metric. Using features like call scoring and conversion tracking, the advertising reports can not only expose which campaigns are bringing in the most calls but also how much revenue can be attributed back to each channel. Our integrations with Google Analytics and Adwords make this especially easy to manage. The reports expose analytics on which traditional channels like Print, TV, and Radio are driving the most calls and generating the most sales. In addition to knowing how many calls have come in, we can provide detailed information about each caller, such as their location, gender, address, and history with your company. Using call scoring and conversions you can see how much revenue has come in from each phone call and channel as well. Don’t waste your advertising dollars on campaigns that aren’t working. CallTrackingMetrics’ advertising reports provide key analytics on the performance of your advertising campaigns, helping you reduce wasted budget and maximize your ROI.